Martha Sneaker https://www.review-australia.com/au/martha-sneaker-white/RE19ACC179.REWHT001.html Sneak these into your collection! 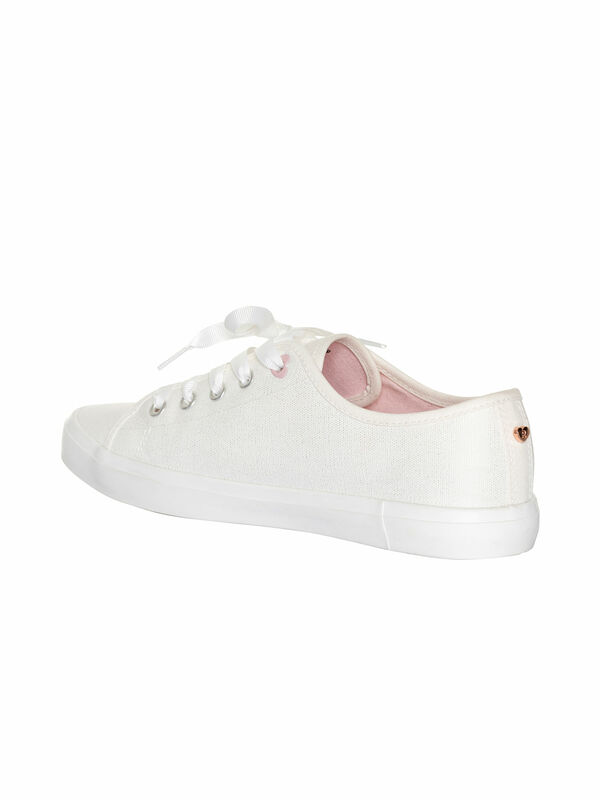 The Martha Sneaker is a summer staple, pairing perfectly with prom dresses, cute knits, and flippy skirts alike. You'll love the cute love heart detail, pink soles and satin laces! These beauties also come with alternative pink laces. Sneak these into your collection! The Martha Sneaker is a summer staple, pairing perfectly with prom dresses, cute knits, and flippy skirts alike. You'll love the cute love heart detail, pink soles and satin laces! These beauties also come with alternative pink laces. Comes with alternative pink laces! Martha Sneaker is rated 5.0 out of 5 by 40. Rated 5 out of 5 by salljong from Love love the sneaker more than I thought I would! When I purchased the sneakers, I wasn’t too sure how I was going to wear them. I normally wear my Review dresses in heels. It was the weekend and I thought I would be too dressed up going shopping with my toddler so I teamed them with my sweet nothing dress. They were a match made in heaven!! I love these sneakers so much that I want another pair. Sadly there are no size 10 :( Please restock!! I want to buy another a couple of pair!! I’m obsessed!! Rated 5 out of 5 by Kimberly Jane from Cute sneaker I was hesitant at first but so glad I purchased. There is detail on the sneaker that does not show on the photos. Perfect to wear anytime and goes with all casual Review dresses, skirts and tops to give you a dressy but cute look. Great alternative to low heels or sandals for comfort. Heart at the back of the shoe is a lovely touch as are the extra pair of pink laces. Sizing is similar to other Review shoes. Rated 5 out of 5 by Becs from SUPER CUTE!! I don't usually wear my review with casual shoes but when I saw these I HAD to have them. I am usually an 8.5 - I purchased the 8 and they are a perfect fit, they are super comfy and cute and have the most adorable features like the heart shaped laces hole at the top, the adorable review heart at the back and also the addition of the extra pink laces... on point review!!!! So CUTE! Rated 5 out of 5 by Lyn1 from Lovely sneaker! I bought my sneakers about a month ago. They are very cute & feminine- look great with dresses or jeans. I got the box home and realised it didn't have the additional pink shoelaces, so I contacted Review customer service and in a week or so, they had posted them out to my house. Excellent shoe and excellent customer service! Thanks Review! Rated 5 out of 5 by SparkyD from Summer staple I was just reading how perfectly these would pair with prom dresses, cute knits, and flippy skirts alike when a 30% sale convinced me! So comfortable, generous C fitting I wore them an entire day straight up with no blisters. After 3 coats of water proofing, they are my new staple & look cute with everything. Rated 5 out of 5 by Deb Sherwood from Perfect casual shoe to match with my review outfit I bought this on impulse telling myself I don't need any more shoes. But these were too cute not to get! Pink soles, love hearts and pink laces included - whats not to love! I wore them for the first time to do grocery shopping and they were perfect!! True to size for me. I can't wait to wear them again. Rated 5 out of 5 by Floral Fan from Feminine and comfortable I really like the style of these sneakers the heart details, pink soles and ribbon laces (in white and pink) make them more feminine than other sneaker options. I also like the light silver speckles on the white canvas which will hopefully keep them looking cleaner for longer. Rated 5 out of 5 by 3/4 sleeve gal from Super cute canvas shoes! These are my second pair of Review shoes. The first time I bought a pair of heels and it fit on the larger size so I went down to 8. I’m an 8.5. I thought it would be the same with these shoes but they fit true so I should’ve gone up to a 9 instead of getting an 8.